Wanting to continue and yet wanting to drop this. I want to drop it because that whole Galactic Pretty Boy thing. =.= That makes it sound like it’s going to be lame later on.– I guess that’s not a good reason to drop it. It’s a bit confusing since it started talking about Tsunashi’s dad, Star Driver, Galactic Pretty Boy, Island, School, Maidens. Too much information that I couldn’t grasp and fully understand. There were those characters that I thought would be protagonists but turned out to be antagonists. The RA girl and the boxing guy, I didn’t think that they would be the evil ones. The animation is nice and smooth. Characters are somewhat unique. The first time I heard Tsunashi’s voice, I immediately recognized it being Kida’s. So, the voice didn’t really fit right until the end. It still seems a bit weird but I’ll get use to it sooner or later. I liked the opening and its use of colors. The ending is nice too. and, and, the North Maiden was asked to sing a song, it was really nice. It sounds so serene and peaceful. I’m wondering if there’s going to be a love triangle or something between Shindo, Wako, and Tsunashi. And about Tsunashi, how did he come to possess Tauburn? and Why is he known or at least seems [in]famous among the group of people wearing masks? 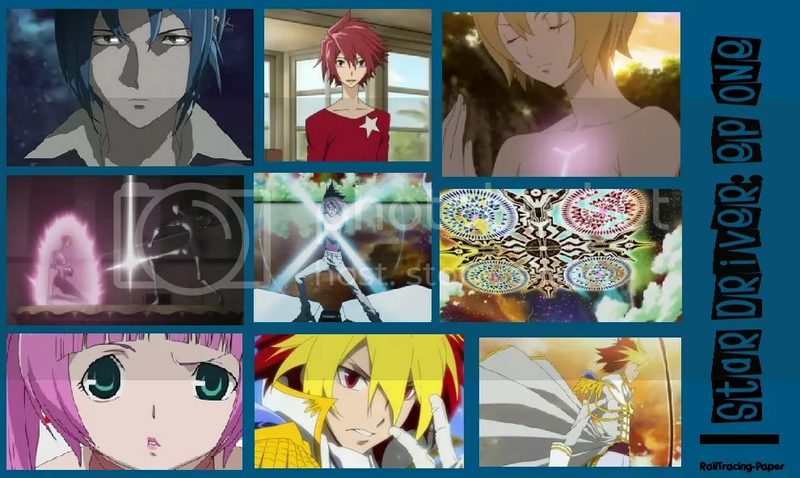 This entry was posted in Anime, Currently Watching, Star Driver and tagged action, anime, Galactic Pretty Boy, Mecha, Star Driver Kagayaki no Takuto. Bookmark the permalink. hmm so should i watch it? Ehh, I can’t really say since it’s the only episode but it has potential. There’s a bit of dry humor. But I think you should try it. You might end up loving it. ahah. i see, well i think about it since my not-so-fast-internet keeps disconnecting every now and then, so watching anime has gotten troublesome. i was patient enough with bakuman and tegami bachi coz i was expecting them. but a new series is a different story. aww, Well then Star Driver can always be watched later when you have time. There’s probably other series that might be better than this one. I havent watched the Psychic Detective one yet but I think you shouldn’t miss that one. lol, is he suppose to be hot? did you watch it raw? ooh, i get it know. well, hopefully you’ll still be able to enjoy it. did the two versions of the manga start off the same? yup though there were some small differences, but basically it was the same. Well, I read the first few pages of the manga and I guess the anime changed it a bit. It wasn’t significant changes, I think. Did you get to watch it yet?